The latest issue of YMAC News is now available. We are very pleased to share with you stories and photos of two native title determinations that took place on-Country last month. Read about celebrations on Nyangumarta Country for the dedication of their Indigenous Protected Area, as well as the Annual Bush Meeting at Yule River where Traditional Owners and politicians met to discuss important issues affecting Country and culture. This issue also includes a profile on one of YMAC’s dedicated committee members, Dion Harris. 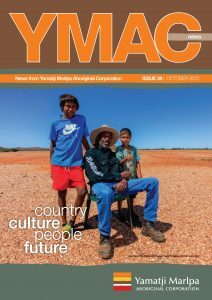 To request a hard copy or to give us any feedback, email editor@ymac.org.au. We hope you enjoy this issue of YMAC News.